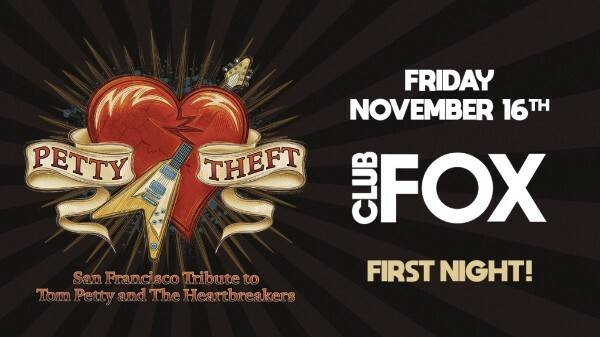 FRIDAY, 11/16 & SATURDAY, 11/17 – Club Fox in Redwood City. 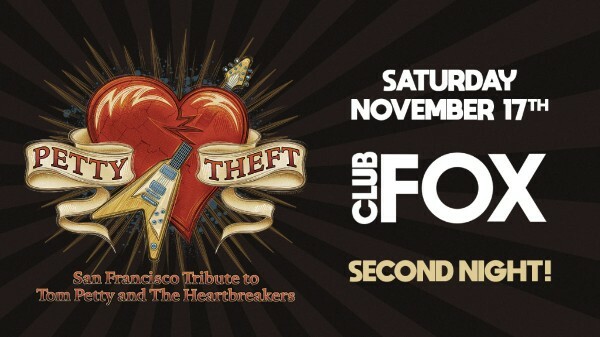 That’s right, for the first time we will be doing two nights at Club Fox in Redwood City both as “An Evening With Petty Theft”, celebrating the musical legacy of Tom Petty. Both nights will feature two different sets so if you wanna hear all your favorites Petty songs you might want to catch both shows… Get your tickets NOW as these shows will sell out! “BLACK FRIDAY” 11/23 – Empress Theatre in Vallejo. We’re headed back to this historic and beautifully restored venue for another evening celebrating the music of Tom Petty. This show will feature two sets (no opener) and is one of the finest settings to hear us play. Tickets are available and on-sale NOW. SATURDAY 12/1 – Mystic Theatre in Petaluma. “An Evening With Petty Theft” celebrating an entire night of TOM PETTY. This is one of our most popular shows of the year. Get your tickets NOW as this show is expected to sell out in advance. FRIDAY 3/1/2019 – Crystal Ballroom in Portland, OR. We are so pleased to be returning to this fantastic venue for another headline show. For our Bay Area fans this is akin to the Fillmore and we are honored to perform the music of Tom Petty here. Opening will be LDW – Portland’s Talking Heads tribute band. Tickets went on sale this past FRIDAY and are available NOW! That’s right we are headed back to Utah! We are looking forward to performing at both of these great venues for the weekend. Last time for our debut we sold out both shows so grab your tickets NOW! For the latest info on our upcoming shows check out our complete schedule for more upcoming dates in your area. Keep up on the latest updates by following us on TWITTER, like us on FACEBOOK (and invite your friends) and follow us on INSTAGRAM! You can also track us on BandsInTown and Subscribe to our YouTube channel and check out our latest live clips. Be sure to ‘like’ and leave a comment. We love to play parties, please CONTACT US to book Petty Theft and rock your party now!